莎草科 Cyperaceae | | 莎草属 Cyperus | | 三轮草 Cyperus orthostachyus Franch. et Sav. Cyperus orthostachyus Franch. et Savat. Enum. Pl. Jap. II (1879)　218; Kitagawa, Lineam. Fl. Mansh. 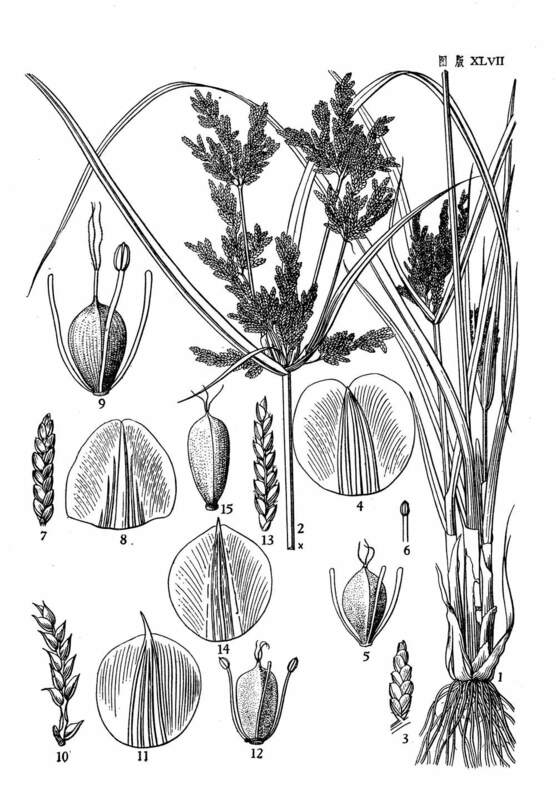 (1939)　115——Cyperus truncatus Turcz. in Bull. Soc. Nat. Mosc. (1838)　103, non Rich. ; Kom. Fl. Mansh. I (1901)　329; C. B. Clarke in Journ. Linn. Soc. Bot. XXXVI (1903)　218; Kukenth. in Engl. Pflanzenr. Heft 101, IV, 20 (1935)　153.